In September 1938, the increasingly frail leader of the Catholic Church, Pius XI, made it unequivocally clear where he stood when it came to denouncing the actions and policies of Nazi Germany. He declared to a group of visitors at the Vatican that it was now simply “impossible” for Christians to support Adolf Hitler’s anti-Semitic campaign against the Jews of Europe. “Spiritually,” the pope announced to his guests, “we are all Semites.” Five months later, however, Pius XI was dead – and his successor, Pius XII, pursued a starkly different agenda when it came to the Vatican’s delicate dealings with Nazi Germany and Fascist Italy. Could the pope have done something, anything, to save Jewish lives during the planning and execution of Hitler’s Final Solution? Did he turn a deaf ear to the pleas of others — Jewish officials, Allied government leaders, leading members of his own church — to use his considerable moral authority to condemn and perhaps lessen the tragedies of Jewish deportations and the horrors of the gas chambers? And in the years and decades that have passed since the end of World War II, how has the Catholic Church responded to the controversial debate over the Vatican’s actions — or lack of them — during the Holocaust? 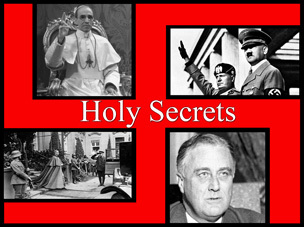 These vital issues and others will be addressed in Holy Secrets— a documentary film that will combine archival footage, modern-day interviews, and compelling visual presentation of historic documents and events as a way of telling the disturbing story of the Vatican and the Holocaust. Steven Pressman is the writer, director and producer of 50 Children: The Rescue Mission of Mr. and Mrs. Kraus, a documentary feature film that premiered on HBO in April 2013 and was nominated for a News and Documentary Emmy in the category of Outstanding Historical Programming. Steven is a recipient of the New Filmmakers Award (awarded for Excellence in Filmmaking) given by the Philadelphia Jewish Film Festival. Along with its television broadcasts, 50 Children has been shown at numerous film festivals, the United States Holocaust Memorial Museum, the National Center for Jewish Film, the National Museum for American Jewish History, the American Embassy in Vienna, Austria, and the Austrian Embassy in Washington, DC, as well as at synagogues, Jewish community centers and other venues throughout the United States. Steve is also the author of 50 Children: One Ordinary American Couple’s Extraordinary Rescue Mission into the Heart of Nazi Germany (HarperCollins, 2014). Steve was born and raised in Los Angeles and received an undergraduate degree in political science at the University of California at Berkeley. He worked for many years as a newspaper and magazine journalist in Los Angeles, Washington, D.C., and San Francisco, where he has lived for several years. Donations are tax deductible. Gifts over $250 will receive a letter for tax purposes. Send your contribution by check made out to "The National Center for Jewish Film". Include "Holy Secrets" in the memo line.